I’ve never had much luck, particularly not at the gambling tables. I’ve never even won a consolation prize in any lucky draws, for crying out loud. So its fair to assume that my foray into Las Vegas’ casinos this time round was a complete washout. A fun and mildly educational trial, but a failure nonetheless. I even lost my phone next to the slot machine, after losing some more dollars playing jackpot. Thankfully, with my favorite girls in the city, we managed to do a lot more than hanging out by the slots machine, thus minimizing my monetary losses while indulging in many good meals and other exploits. The Venetian and the Palazzo hotels and casinos were our stomping grounds and we spent an inordinate amount of time there, resting, shopping, gambling and eating. Oddly enough, our restaurant choices veered from the Italian theme of the hotel, and we ate at not one, but two French restaurants. We made full use of Ying’s 40% staff discount at Pinot Brasserie – its wooden panelling and crimson banquettes evocative of a French country inn – slurping oysters and indulging in rich dishes that were not quite appropriate for the 95 degree weather but enjoyable nonetheless, such as thick onion soup with a gooey surface; a tasty but miniscule sliver of foie gras perched on top of an expertly panfried scallop, and a rich lamby osso buco served with pasta that were tinged red from the wine sauce. I also revisited Bouchon for a round of breakfasty foods, including the french toast bread pudding that was similarly well received as it was the last time, although the meal was somewhat lackluster compared to my previous visit. 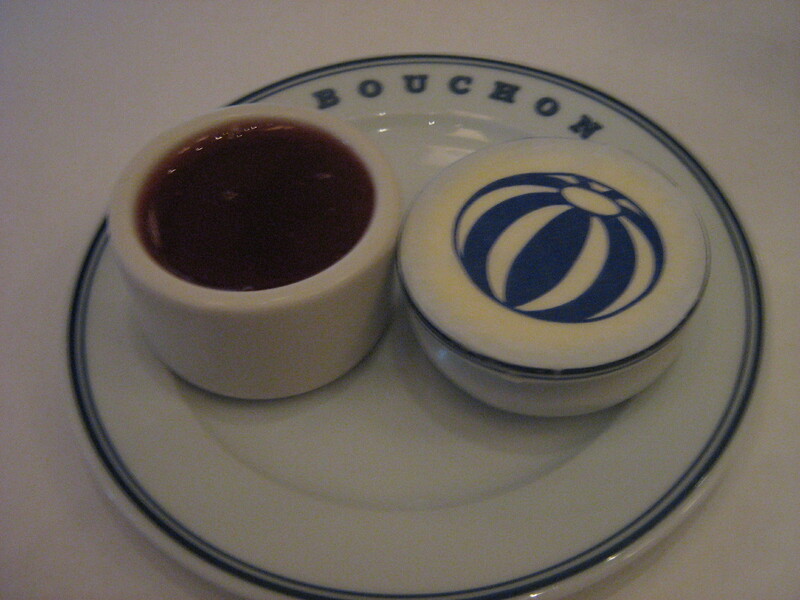 But we all loved the atmosphere at Bouchon, light and airy, bustling yet private. Where space is a premium in NY, its definitely not in short supply in Vegas. We also ate at Grand Lux Cafe after our champagne brunch plans at the Wynn was thwarted by prodigious lines even at 2 in the afternoon. Its somewhat of a cop-out choice, and my salad tasted like it could have been made in the neighborhood Chipotle, but with fast and friendly service, low prices and virtually no wait, there could not have been a better choice. 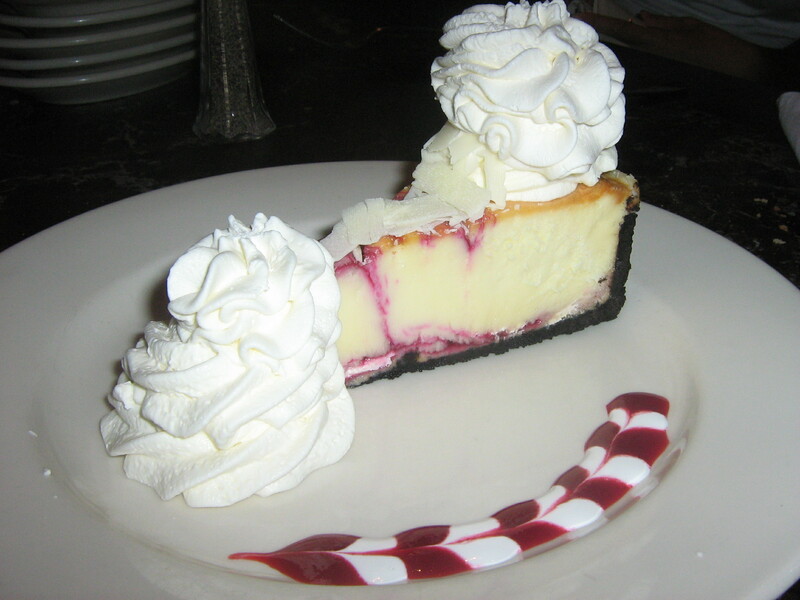 The cheesecakes from Cheesecake Factory and slurpable fruit drinks accessorized with brilliant fruit toppers are just icing on the cake. Sweets are never too far from my mind, and Ying, Peiyun and I found the rich, chocolatey frozen drinks at Ethel’s Chocolate in the Fashion Valley Mall superior to its direct competition, the Starbucks Frapuccino by a long shot. My strawberry and white chocolate drink was especially enjoyable with the tartness of fresh strawberries tempering the sugary sweetness of chocolate. The store is decorated in bold pink, orange and purple shades, suitably appropriate for a girly treat to cool one’s heels and credit cards in the gigantic mall. In Jeff I found a willing accomplice for dessert. Whereas the girls were only looking for a place to sit, cool down and rehydrate from our post-dinner walk to the Bellagio for the awe-inspiring “O” show, J and I made our way to the Jean Philippe patisserie, for him a cup of mango sorbet, packed with fruit flavor, and for me a decadent chocolate opera with gold leaf and a chocolate truffle topping the slice, shared of course. Pricing is rich as one can expected in the Bellagio but what can you say when your choice is the patisserie or a thirty minute wait at the Bellagio Cafe? 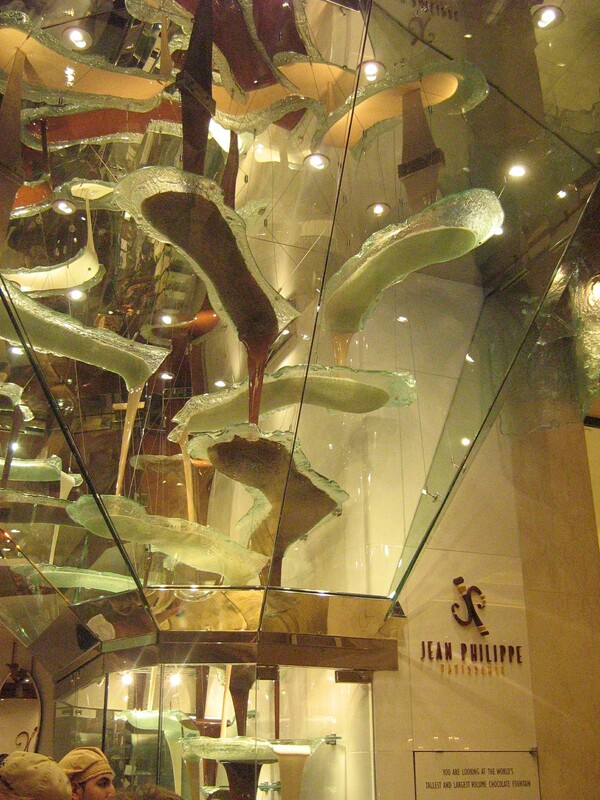 Besides the beautiful desserts, Jean Philippe’s patisserie is also home of the world’s largest chocolate fountain, which in and of itself is a piece of art reminiscent of the Chihuly glass works that also grace Bellagio’s lobby, made enhanced with the viscous pools of different colored molten chocolate simultaneously flowing down. 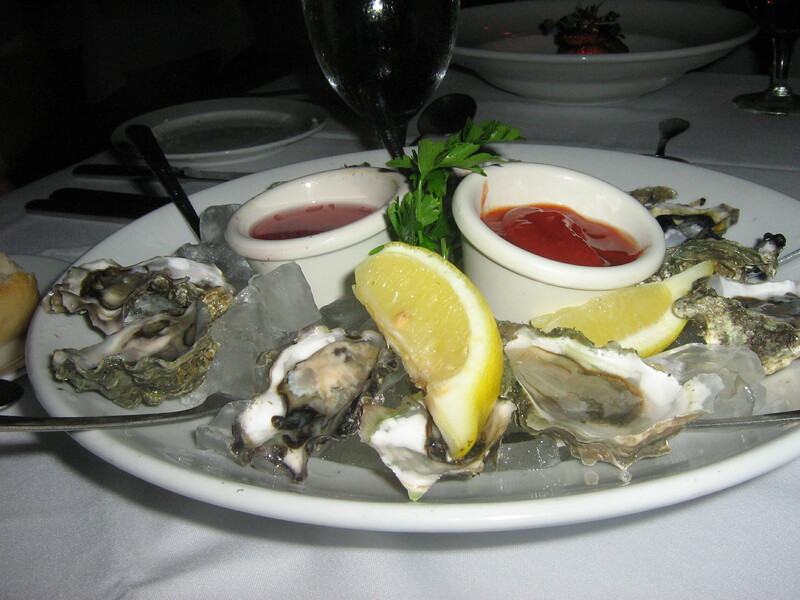 We found ourselves off the Strip on occasions to eat, like the Cathay House for non-too memorable dim sum and Lotus of Siam, a Thai restaurant once hyped as “the best Thai Restaurant in the US” by Gourmet Magazine, and house of excellent Thai food and a formidable Riesling list. LoS, as the locals call it is known for its version of aromatic and spicy Northen Thai cuisine, and what we ate didn’t disappoint us. Nam Kao Tod was an addictive salad of crispy rice, minced meat, onions, peanuts, lime and herbs, while the Tod Mun Plar were golden patties of curried fish cakes that TPS chomped into with relish. 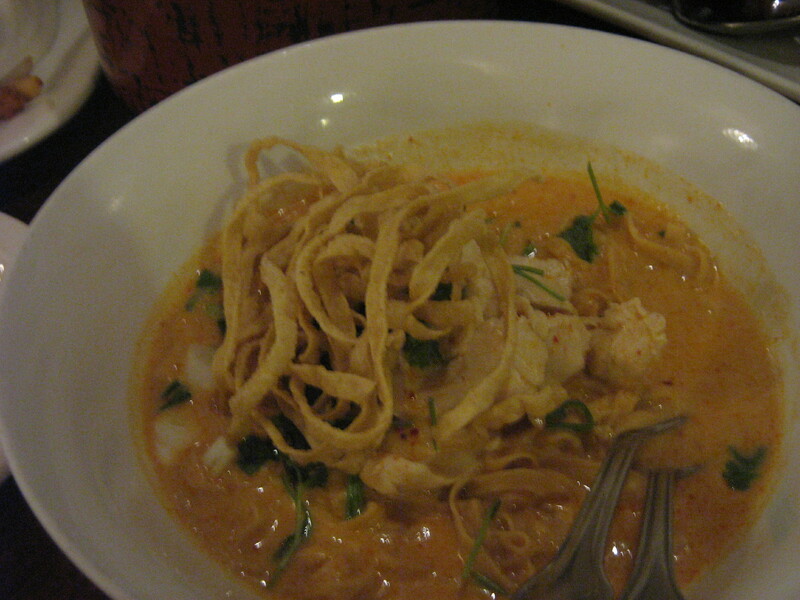 Peiyun and I showed our full appreciation of the rich, creamy, flavorful Khao Soi by wiping the bowl clean of sauce long after the tangle of cooked and fried egg noodles were decimated by the four of us. We also ordered cat fish basil and ended the meal with mango and sticky rice. Duck curry was the only disappointment in my opinion, the curry complex but the dish sorely lacking in any meat. 4 out of 5 dishes though is not a bad score. I miss those fish cakes. SO GOODDDDDDD. stop it about the fishcakes already, you should be missing us! no see, I know I will see you again, and soon, but I don’t know when I will eat that fish cake again!!!! Haha.